Many of you young whippersnappers probably don’t know, but at one time WWE Hall of Famer Sgt. Slaughter was a G.I. Joe. Yes, he was a real American hero and a cartoon character. The former U.S. Marine was the first real-life person to become part of the iconic toy line. Hasbro modeled the toy after his in-ring wrestling persona. They even gave his toy a few wrestling moves. 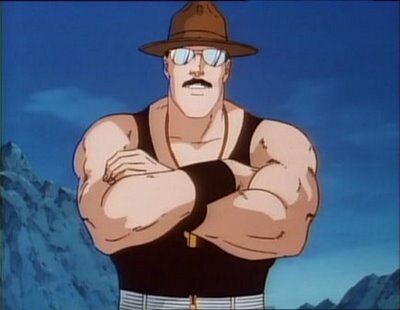 Along with his likeness, Slaughter would also lend his voice to numerous episodes in TV series, as well as, the first animated G.I. Joe movie. During a recent interview, the former WWF champ revealed that he almost had a cameo in the first film, G.I. Joe: Rise of Cobra, and the upcoming sequel G.I. Joe: Retaliation. ..my sources told me, that I was suppose to have a cameo and that the character that Bruce Willis plays was suppose to be me originally, but they couldn’t use Sgt. Slaughter. It is understandable that the sarge would want to be part of the film. He was a big part in the success of the toy franchise and the TV show. It’s also nice to know that he would have been fine having just his character be included in the film. Even if it wasn’t me playing the part, it would have been great to have my just my name and likeness in the film, but just to know that I was thought of is good. Do you think Sgt. Slaughter character should have been included in the film? Lets us know in the comments below and watch this classic G.I. Joe commercial.